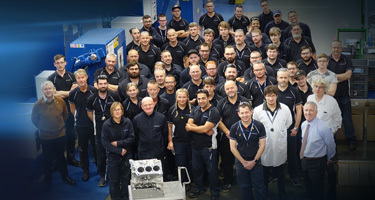 Coinciding with Cosworth’s 60th anniversary, we have reached an impressive manufacturing milestone at our Advanced Manufacturing Centre in the UK. Just over 30 months since production began in earnest, the 30,000th engine component has rolled off the line at the state-of-the-art facility in Northampton. We have never been a company to rest on our laurels. We have always sought to remain relevant and ahead of the curve. So, when we announced plans to build a brand new facility on our Northampton site, heads turned at the company’s ambition. The £22 million, 38,000 sq ft AMC is a flexible manufacturing facility, enabling Cosworth to offer world-class automotive quality in the traditionally difficult niche volume range. With a winning combination of latest machine tools and robotic technology working alongside highly skilled engineers and technicians, the AMC has allowed us to enhance our reputation as an innovative industry leader in the world of automation. A Flexible Manufacturing System (FMS) palletech system provides a robotised link between the casting load stations and network of machining centres, providing unsurpassed productivity with minimal floor space. A central computerised production flow simulation and scheduler optimises the flow of parts through the system. The AMC is a flagship element of Cosworth’s range of engineering and manufacturing services for high performance, fast road and hybrid ICE vehicle applications, all to TS-accredited standards.